Are you reaching for a new peak? No matter where you are in life—how high or how low—you have three choices: go higher, go lower, or stay in the same place. Choose higher! Look up! Look forward! Keep reaching! Instead of sliding backwards, instead of stopping, instead of giving up, choose to keep going. Choose to keep moving forward. Choose to keep reaching. Keep creating to reach a new peak. Keep creating to find a new peak. Keep creating beyond what you think your peak is. 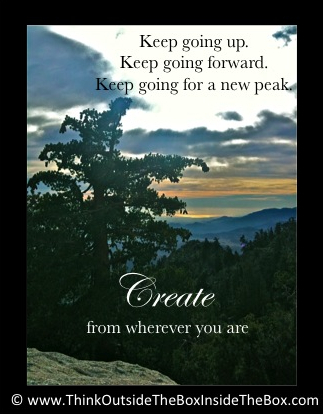 Create from wherever you are with whatever you have right now and keep reaching for a new peak. Keep going for a new peak. Create from wherever you are. Create from whatever you have. Reach for a new peak. Keep reaching forward is a great message! Even when the climb gets rocky we need to keep going. Great reminder here.